One of the reasons I was drawn to drama therapy as a career path is because I value the power and complexity of non-verbal communication. Anyone reading this who knows me is laughing to themselves right now because they know I can TALK. So, maybe it is more accurate to say that I am a lover of all forms of communication and a proponent of access to it. This is why I love drama therapy–it offers endless communication options. If you can’t express your inner life in words or if you speak a different language, drama therapy can offer an embodied, physical alternative; if your heart’s voice pours out in sonnet form, we’ve got a place for that; and if it’s too difficult to speak from your own voice, come on down because drama therapy has got a safely distanced projective technique for you, my friend. Drama therapy’s inherent boundary-crossing power lies in its capacity to adapt to many different forms of communication and translate without verbal language. I am the proud ENACT site director and drama therapist at a high school whose student population is comprised of over a third English Language Learners (ELLs). The majority of those students’ first language is Arabic with a large number of students who immigrated from Yemen. One day in the copy room (the public school version of the water cooler, I’m finding), I got into a conversation with one of the English as a Second Language (ESL) teachers about the emotional life of our beginning ELLs. This teacher shared with me that some of her students have expressed that they think they are “dumb” just because they are overwhelmed by the demands of learning a high school curriculum in a language that is not their native tongue. If you are a native English speaker, imagine being thrust into a school in Yemen where you are expected to keep up with class work as well as adjust to a whole host of cultural norms without fully having the vocabulary to convey if you are feeling confused, frustrated, angry, embarrassed, or sad. Imagine being continuously misunderstood with no one to tell you that the resulting feelings of frustration and overwhelm are totally normal. This ESL teacher and I discussed how many behavioral issues seem to stem from this dissonance between emotional experience and ability to express. It is easier to goof off in class than explain “I am embarrassed that I don’t understand the material” and it is easier to pick on a fellow student than to share “I’m jealous of how easily this is all coming for you”. This phenomenon is certainly not unique to English Language Learning students (which is why ENACT focuses on teaching social/ emotional competencies to all staff and students), but it is certainly compounded by a language barrier. 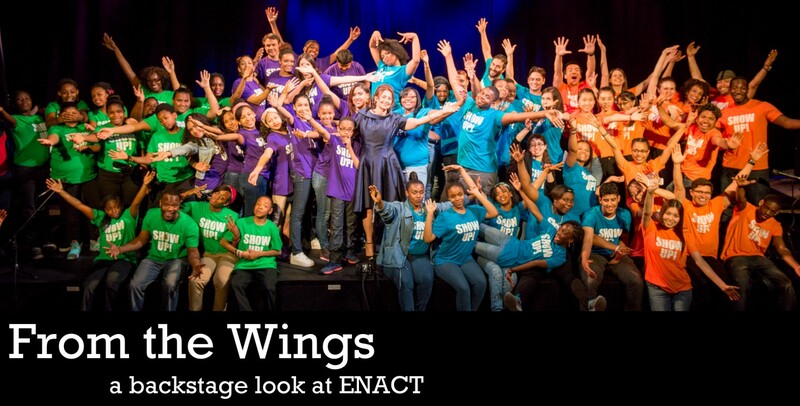 In my relatively short time at this school, it has become abundantly clear how important it is for ENACT to actively respond to and support the unique needs of this part of our student population. One of the ways this has manifested is in a group I lead with students who are beginner ELLs. These groups were created to focus on emotional recognition and the behavioral masks we may wear to hide the emotions we can’t explain. An Arabic translator is available for the entirety of the group to make sure that we are all on the same page, but much is able to be communicated nonverbally. The groups give us the opportunity to explore, in an embodied way, what emotions may look like visually and what they feel like somatically so students can then attach those physical experiences to both the English and Arabic terms and become more comfortable expressing them. We then open into activities that, with varying levels of distance, allow the students to speak about their personal experiences of these emotions. In one group, we utilized a developmental theatre game called Emotional Museum. In this activity the students milled around the room and when I called out an emotion they froze and then transformed into a statue representing that emotion (they also had the option to draw a piece of art if that felt safer, but I was surprised to find that everyone chose the embodied option). Some of the class then acted as ”museum patrons” who discussed these pieces of human art and practiced identifying emotions and sharing associations and connections. I called out AFRAID and we focused on one young man who was frozen with his hands outstretched in front of him in a protective way, tension crumpling his face and furrowing his brow. I asked the group when they have felt fear at school and answers such as “when I have a test” and “when I have to speak in front of the class” were shared. When I asked when we may experience fear outside of school, however, the tone shifted and yielded responses like “when I see cops” or “when I hear a loud noise, it reminds me of bombs going off back home”. These were a poignant reminder of the level of vicarious (or direct) traumatization many of these students are facing on top of the average high school stressors. When diving into the layers of these student’s emotional lives, it is also impossible to ignore the current climate of Islamophobia and stereotyping of people of Arab descent in the media and elsewhere. We may be unable to control unfortunate misconceptions or less-than-welcoming attitudes towards immigrants that exist outside our school doors. However, by making space for the individual emotional experience of a student who is an immigrant or a beginning English language learner, we are creating a culture of community, safety, and freedom from within. We are sending the message that no one will be left to their own devices to weather the hurricane of feelings they may be experiencing. Finding myself in this school environment feels like a precious opportunity to help create warm, empathetic young people who then go out into the world knowing how to express their emotional needs and recognize when their actions contradict their inner experience. This falls in with ENACT’s mission to support student growth through self-awareness and positive communication. The implications of this work are great with all of our students, but they have been particularly highlighted for me in my work with our beginning ELL students. Drama therapy gives us the tools with which to safely cross boundaries, recognize each student’s unique humanity, and speak the universal language of feeling. Rebecca is a Registered Drama Therapist, Licensed Creative Arts Therapist, certified Child Life Specialist, and actor. She works as a site director/drama therapist at a high school in Brooklyn where ENACT has a full time partnership. This entry was posted in Drama Therapy, Fieldwork and tagged communication, diversity, drama therapy, ESL, language. Bookmark the permalink. Hi Rebecca, you’re doing good work. Teaching emotional intelligence is important. Please have the webmaster change the background to a much lighter color so that it’s easier to read for an old fella like me. Indeed, might enact adapt its work for different age groups? My best regards to Diana Feldman. I lightened up the background color a smidge. Hope that helps.